Thinking about creating a team? Try the Corporate or School Challenge! Corporate Challenge-the business with the most participants will receive a personalized plaque to display in their office to show our appreciation for their support! School Challenge-the school or department with the most participants will receive a personalized plaque to display in their front lobby to show our appreciation for their support! Proceeds from the 5K support the Take Stock in Children Scholarship Program. With the support of donors like you, over 600 Lee County Children have earned a life-changing scholarship. Take Stock in Children Lee County is a mentoring and incentive program that provides doorways to success for deserving low-income students of Lee County. The Foundation for Lee County Public Schools is a non-profit, charitable education foundation which enhances and enriches the quality of public education in Lee County for students and educators. The Foundation’s programs, resources, and experiences are made possible through corporate, individual, and educational partnerships. BE SURE TO USE #leestrides TO SEE ALL EVENT PHOTOS! 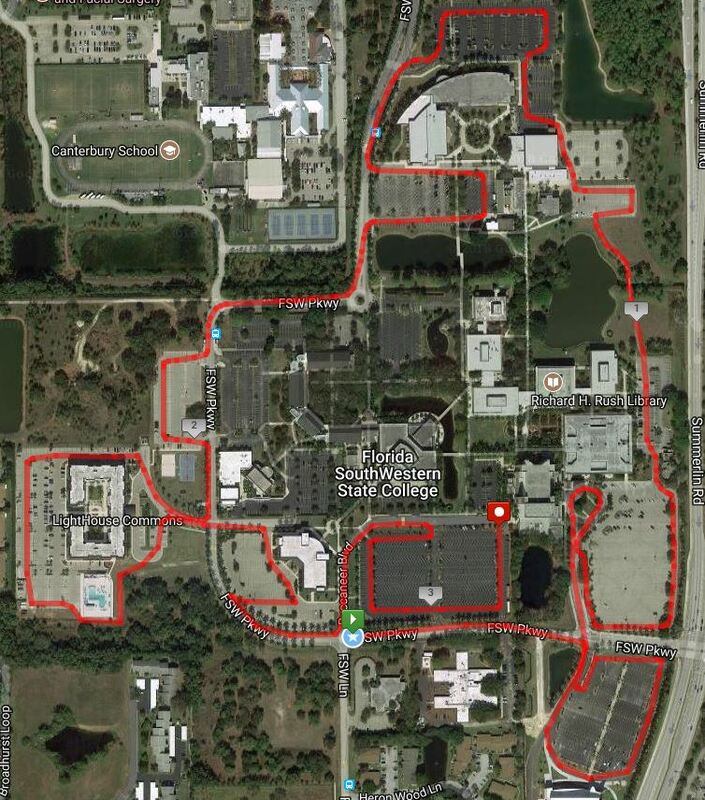 The 5K course includes a shaded tour of Florida SouthWestern State College’s beautiful campus. Serious runners will appreciate the race bibs with chips ensuring an accurate race time. This race will be put on by the Fort Myers Track Club. You can also run for the fun of it, stroll with family and friends, or bring your kids out to the kids’ dash. The race begins and ends in Parking Lot 6, which is near the Barbara B. Mann. The best entrance would be the Summerlin Road entrance and park near the Barbara B. Mann. Parking Lot 6 will be closed due to the race but there will be police officers assisting with traffic control at all nearby parking lots. Encourage your family and friends to watch you cross the finish line and stay to watch the kids dash, and enjoy the entertainment like our live DJ, bounce house, photo booth, awards ceremony, and more! The First 1,100 runners will receive a LONG-SLEEVE, DRY FIT SHIRT and reusable race goody bag!! Thursday, January 31, Noon – 6:00 p.m. Detailed race information is available to download by Clicking Here! © Copyright takestockinchildren 2016. All rights reserved .